Drink-drive limit 'unfit for purpose' | What Car? The current drink-drive limit has been branded 'outdated and unfit for purpose'. That was the view of Scottish Justice Secretary Kenny MacAskill as the Scottish Parliament debated drink driving. The current limit is 80mg of alcohol per 100ml of blood, which has been in place for the past 40 years. 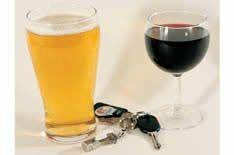 The Scottish Government is aiming to cut the limit to 50mg, but any change in the drink-drive limit would have to be agreed in Westminster.